Better LivingBusiness and LegalBusiness NamesCleaningConsumer AdviceCraft Projects and TipsEntertainmentFood and RecipesGardening Tips and AdviceGrowing GuidesHealth & BeautyHolidays and PartiesHome and GardenHome and Garden RepairHow do I Grow..?How do I Repair..?Make Your OwnOrganizingParentingPetsTravel and RecreationWeddings for LessWhat is it Worth?What is this Bug?What Is This PlantWhere can I Buy? These questions don't have answers yet. Can you help them out? 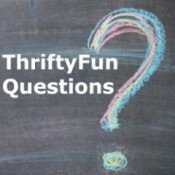 ThriftyFun is powered by your wisdom. Growing a Houseplant in Water BeadsI would like to transition a small houseplant to grow in water soluble water beads. It is now in potting soil. Is there a gentle way to transition the plant out of the potting soil without too much trauma? Transplanting Shrubs and LiliesCan you dig up and relocate shrubs and lilies in August? Transplanting Large Old Lilac BushesWhen we moved here a year ago, a structural engineer said the 4 large old lilac bushes are too close to the foundation of the house and are causing problems. All are at least 10 ft high. One has so many shoots it is about 4 ft wide at ground level. Transplanting a Weeping WillowCan I transplant a weeping willow? And if yes, how do I do this? Transplanting Older SunflowersI would like to relocate some older (about 1/2 grown) sunflowers. How can I do it without killing the flower? Thanks for any help or advice. Can I Transplant Older Sunflowers?I want to move my sunflower plants from one area to another. Can I do this without killing them? If so, how do you recommend I do this? Transplanting LupinsCan small Lupinus perennis plants be successfully transplanted to a new location? Transplanting a Gooseberry BushOne of my bushes had very small berries this year and I think it's too close to another bush. So when would be the best time to move it and does it need any special soil/treatment? It is 3 years old. Transplanting a Young Willow TreeThe willow is about 2 years old and has started to bud. Is it too late to move it? 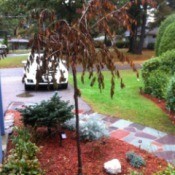 Transplanting a Weeping CherryI have two 12 year old weeping cherry trees, and they are too close together. Can they be transplanted and if so how do I do it without killing them? Leaves Brown After Transplanting Weeping...I had a healthy 2 yr old dwarf weeping cherry tree that I transplanted to the front of my yard that gets plenty of sun. It was out of the ground less then 1/2 hour before replanting. I noticed it started wilting immediately. Transplanting and Pruning a Butterfly BushIf I plan to transplant my butterfly bush in the spring, should I prune before I transplant or transplant and then prune? Transplanting "Lucky Bamboo" OutsideI'll be planting it outdoors in our most moist well draining shady spot on our Big Island upland property. Will it spread? Transplanting a HibiscusMy brother has a hibiscus that was cut back this spring and the new growth is starting. I want to know if it is still OK to transplant it now or do we have to wait until fall. Separating Two Norfolk Pine Trees Growing in One PotI have a Norfolk pine that has two trees in one pot. Can these be split when repotting? Planting Lilacs in ContainersHow deep and wide does my container need to be when planting 2 baby lilac bushes? Can they be planted in containers to start with? I have no knowledge. So any answers will help I hope. Transplanting LilacsI have two 8ft tall light purple lilac bushes I'd like to transplant from the southern side of my house to the northern. I was wondering if they will do as well, and when is the best time to move them? Transplanting a T fortunei PlantI have a T fortunei plant. I am wondering when or if a 6 foot plant be transplanted? Transplanting a Willow TreeCan l move my willow tree from the ground to another place, as it has no room to spread? Growing Trumpet Vines from CuttingsI want to give a friend some baby trumpet vines. How do I get the runners to start? Transplanting of Weeping Cherry TreeI dug out a small weeping cherry tree from an overgrown terrace. 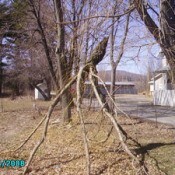 It is about 5 feet tall, with a trunk about an inch+ in diameter. In the process of trying to wrestle out its roots, I managed to lose all the soil around the four prominent roots which I had to tear away from the ground. Transplanting a Bay Tree SuckerI would like to know how to transplant a sucker on my bay tree, which is growing in a pot. Transplanting TreesI would like to transplant trees from a lot next to us to our property and every time I try this the tree dies. I don't know what to do. The lot next to us will only be cleared one day and the owner told us to help ourselves to anything we wanted. What should I do? Transplanting a Bat PlantI have a bat plant. When can I transplant it from the garden to a pot, we are moving? It has flowered already. Transplanting a Butterfly BushI transplanted a 6 foot, 2yr old butterfly bush today. Now I am wondering if I should have waited until spring. It was over-crowding everything in my garden. I feel that I got a substantial root-ball and I will mulch it very well. Transplanting IrisesWhen is the best time to transplant iris? Growing Morning GloriesWhen are we suppose to plant the morning glories? Do I transplant as soon as I see them coming up in the peat moss pots or after they are bigger? Transplanting a Lilac BushWhen is the best time to transplant a small lilac bush that has not bloomed yet? It has four separate shoots about three feet tall. Transplanting LilacsCan lilac bushes be transplanted and if so, when should and how can this be done? Transplanting the Babies from a Ponytail PlantCan you please tell me how to graft off baby ponytail plants from the mother plant? It has 4 new babies; they have been growing about 5 months now. Transplanting Wild Sweet PeasSweet peas grow wild along the sides of the road, where I live. Can I dig them up as the they bloom, or is it best to find them and dig in early spring? Transplanting a LilacI am transplanting a small lilac bush. Would it improve the chances of it growing if I used rooting hormone? I am transplanting the lilac into gardening soil and compost mix, around the root ball. Transplanting Wild Roadside FernsI am trying to transplant roadside wild ferns in my landscape as decorative plants. 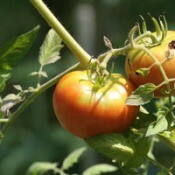 They come from the side of the road and poor soil, but close to dampness. How and When Can I Transplant Roses?I need to transplant a few rose bushes along the side of our garage to the other side of our garage. Ultimately, we plan to lay down fabric and then put river rock in the bed. Transplanting Lilac BushesI transplanted three lilac saplings recently to a location in my front yard. I gave them a good dose of Miracle-Gro and set them into holes filled with top soil. They are spindly, about 4-5 inches high. Should I trim them down? Use Banana Peels When Transplanting RosesI am getting ready to plant a climbing rose bush. Will banana peels help if I put them under my rose bush before I plant it? Hot Caps For Delicate SeedlingsUsing a gallon jug as a hot hat, what is a good time to plant tomatoes outside? Transplanting a Lilac BushI have three 4 foot high lilac trees saplings which I want to move into my front yard. They have already started to bud. When is it safe to transplant them? I would also like instructions on how. Transplanting HibiscusCan you transplant hibiscus and garden flox from one area of a garden to another? If so, when is the best time to do this and how do you do it? If not, can you start plants from stems of these plants? Transplanting Maple Tree SeedlingsI've been doing some research and your article on "How to Transplant Trees" has given me a glimpse of hope with a maple tree I just attempted to transplant. I'm in the midst of green leaves turning brown and dry. There are hardly any green leaves left. Transplanting Calla LiliesI have a calla lily and was wondering if I can plant it outside now, in July? Or will that disturb it? Transplanting a Butterfly Weed PlantHow do you transplant a butterfly weed plant? I would like to transplant one that is overgrown to a new area. Is it possible? These are plants that have orange flowers in the summer. Transplanting SucculentsHow do I transplant "hen and chicks" plants? Transplanting Vegetable PlantsI am moving to a new house and this is the 1st year my son and I have planted a garden. Everything is doing great and I want him to be able to enjoy his hard work. Can I transplant his cantaloupe, tomato, pepper, and cucumber plants? Transplanting African VioletsI recently repotted my African violets and they are droopy and are turning grey. What did I do? I have repotted them before and had no problem whatsoever. Transplanting PhloxWhen can I transplant creeping phlox? They are really thick. Transplanting Norfolk Pine SeedlingsWhile watering my Norfolk pine, I found 2 other little trees. What is the best way to transplant these little ones?Thanks. Plants Look Bad After TransplantingI have transplanted a bunch of plants and they look terrible. How long does it take to know if the they are going to live? It's mostly ground cover and daisies. Transplanting SunflowersI want to replant a few sunflowers. Where do I start cutting? Do I stick the flower in the ground or pot first? Do I water everyday or once a week? When Do I Transplant Lilacs?When is the best time to transplant a lilac bush or get starts from it? Transplanting a Bleeding Heart PlantCan I move my bleeding heart plant now? I'd like to plant it in a different spot. Relocating a Mature Lilac BushI want to move a lilac bush because it is too close to the house and is causing a problem. How can I do this? When is the best time to move this lilac without losing it? It is kind of big, maybe 5 to 6 years old. Thank you. Transplanting and Caring for ShamrocksI have some flowering shamrocks growing in my yard. I want to know how to transplant some into pots, as they need thinning. I also need to know how to take care of them while they are growing. Transplanting a Sweet Gum TreeCan you transplant a gumtree after it's gotten up to 18 ft. tall? Transplanting A Peony PlantI would like to know how to transplant peonies. Transplanting RosesI want to know if it is too late in the fall season to dig up my friends roses and replant them in my yard. She is going to throw them away and it is now Nov. 18th. Transplanting Rivermallow BushesI have two Rivermallow bushes that have been growing in my garden for four years. They have gotten huge and I desperately need to dig them up and move them. I was told to do this in the fall, but the bushes have a huge root system. Transplanting Strawberry PlantsCan I still transplant my Everbearing strawberry plants if we already had our first frost? 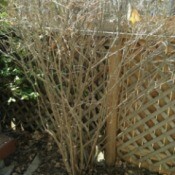 Transplanting a Rose of SharonWhen is the best time to dig up and replant a Rose of Sharon tree? Thank you. Transplanting Rosa RugosaI tried replanting "sea" or beach roses as they can be known as. Rosa Rugosa I believe is the other name. It doesn't look like they may make it, is there anything I can do? Transplanting a Coral BellI have a large Coral Bell plant that I want to transplant. Will it hurt it to be moved and if not, when should I transplant it? Transplanting a Trumpet VineWhat time of year should I transplant a baby shoot from a Trumpet vine? How do I do it? Transplanting a Euonymus ShrubHow do you transplant euonymus? Transplanting Moss from the WoodsIf I pick up a fair sized rock or large piece of bark and place them in the shade in my garden will they need anything else other than misting or watering? Transplanting A Chocolate Mimosa TreeI would like information available on transplanting a chocolate mimosa tree? I had to move one and am wanting to know the survival rate? Transplanting Montauk DaisiesI am transplanting Montauk Daisies. Any ideas as to amending the soil naturally? Our area is grandular, stone, sand etc. Out of the 8 plants I've transplanted only 2 look healthy, the others are very droopy. Transplanting OrchidsI am looking for tips about transplanting orchids. 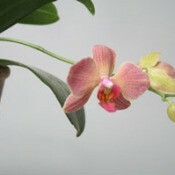 Repotting orchids is really only necessary when the plant has outgrown its pot, or the growing medium needs refreshing. Transplanting Climbing Rose BushHow and when can you move (transplant) a climbing/trellis rose bush? I don't know the name of it, but it has beautiful, bright magenta roses about the size of a tennis ball when it blooms. We have it at the end of our house but want to move it in order to pour a patio. Any advice is much appreciated! Planting Pepper Plants in Pots for WinterI have four banana pepper plants and was wondering if I could put them in pots for the winter? They are about three feet tall and still putting out peppers. How do I overwinter Dogwood seedlings?I started some dogwood seeds this past spring, and I now have 39 seedlings. Most of them have 5 or 6 sets of true leaves, and are approx. 6 - 7 inches tall. They are in 4" peat pots right now, and are situated to get morning sun with afternoon shade. 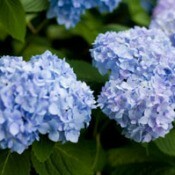 Transplanting A Hydrangea BushI need to transplant a medium/large well established hydrangea bush ASAP. However, I don't know if this is the safest time of year. Should I act now or wait until fall? Any other transplanting tips on this bush would be very helpful. The bush has sentimental value and losing it would be tragic. How big of a branch can I transplant?How big of a branch can I transplant? This broke off my tree. It's about 10' high and the part at the end is about 12" in diameter. Transplanting a Butterfly BushCan a butterfly bush be transplanted after it has been planted in the ground for 13 months? It was given in memory of my 20 year old son's murder in 7/06. Separating Plants in a Dish GardenI received a lovely large dish garden. It has 8 different plants. When should I separate and repot? When is the best time to transplant Lilac Bushes?When is the best time to transplant Lilac Bushes? These are young small bushes. Transplanting Crepe MyrtlesI am looking for information about Transplanting Crepe Myrtles and dogwoods, what is the best way? 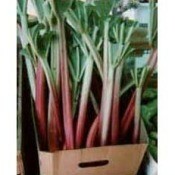 Transplanting RhubarbWhen is the best time to relocate a rhubarb patch? 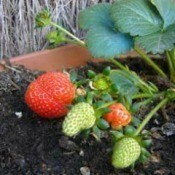 Transplanting StrawberriesI have an existing strawberry patch that hasn't done well in 2 years. I want to transplant to start a new patch. Am I able to do that this fall or do I have to wait until next spring? Transplanting Spy Apple PlantsI have just obtained two Spy Apple plants. They are about three feet in height in the pots. Please advise me on transplanting. Transplanting a Surinam Cherry TreeI have just found out that I have a Surinam Cherry Tree. It was there when we moved in 7 years ago. I never knew what it was so I would chop it to the gound every year. It is planted very close to the house on the north side with no sun. This year I let it grow and it actally has blooms on it. From Germination to TransplantingI have spent a lot of time, effort and money purchasing the best seeds for my garden, and seed germination is a 100%, when i keep them in a dark and moist place. My trouble begins after that when my baby plants die since I don't know the size where they are to be transplanted. I managed to save only 7 (or so) out of 20 plants.